At the height of his career, Vivaldi received commissions from European nobility and royalty. The serenata (cantata) Gloria e Imeneo (RV 687) was commissioned in 1725 by the French ambassador to Venice in celebration of the marriage of Louis XV. The following year, another serenata, La Sena festeggiante (RV 694), was written for and premiered at the French embassy as well, celebrating the birth of the French royal princesses, Henriette and Louise Élisabeth. Vivaldi’s Opus 9, La cetra, was dedicated to Emperor Charles VI. In 1728, Vivaldi met the emperor while the emperor was visiting Trieste to oversee the construction of a new port. Charles admired the music of the Red Priest so much that he is said to have spoken more with the composer during their meetings which lasted for 2 weeks than he spoke to his ministers in over two years. He gave Vivaldi the title of knight, a gold medal and an invitation to Vienna. Vivaldi gave Charles a manuscript copy of La cetra, a set of concerti almost completely different from the set of the same title published as Opus 9. The printing was probably delayed, forcing Vivaldi to gather an improvised collection for the emperor. Coffee has a long history in Italy. Venice was one of the first European ports to import coffee beans in the 16th century, and in the 19th century, men in bowler hats met in Turin’s coffee shops to plan for the country’s unification. When it comes to historical Italian coffee, you can not help but talk of Venice. It is in this lagoon city that the tradition of coffee was born, that due to its position and its trade relations with the Arab world, which then spread to the rest of Italy. The first “botega da caffè“ in Piazza San Marco existed already at the end of the seventeenth century; and even the master of the Venetian theater, Carlo Goldoni, dedicated one of his works the coffee shop. But the real explosion of the phenomenon took place in 1700, with the emergence of numerous cafes and bars. Among these, one of the best known and oldest is undoubtedly the Florian, even now the symbol of the city. The Caffè Florian was founded in 1720 and opened under the name “Alla Venezia Trionfante – InVenice Triumphant.” From then on, this elegant building has been characterized by its exclusive products and guests: here, noblemen, politicians, intellectuals and womanizers would meet, protagonists of their own time, such as Carlo Goldoni and Casanova, Vivaldi, Albinoni or, more recently, Gabriele d’Annunzio. 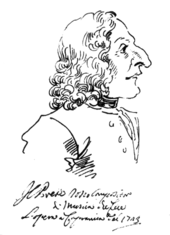 Accompanied by his father, Vivaldi traveled to Vienna and Prague in 1730, where his opera Farnace (RV 711) was presented;it garnered six revivals.Some of his later operas were created in collaboration with two of Italy’s major writers of the time. L’Olimpiade and Catone in Utica were written by Pietro Metastasio, the major representative of the Arcadianmovement and court poet in Vienna. La Griselda was rewritten by the young Carlo Goldoni from an earlier libretto by Apostolo Zeno. Like many composers of the time, Vivaldi faced financial difficulties in his later years. His compositions were no longer held in such high esteem as they once had been in Venice; changing musical tastes quickly made them outmoded. In response, Vivaldi chose to sell off sizeable numbers of his manuscripts at paltry prices to finance his migration to Vienna. The reasons for Vivaldi’s departure from Venice are unclear, but it seems likely that, after the success of his meeting with Emperor Charles VI, he wished to take up the position of a composer in the imperial court. On his way to Vienna, Vivaldi may have stopped in Graz to see Anna Girò. It is also likely that Vivaldi went to Vienna to stage operas, especially as he took up residence near the Kärntnertortheater. Shortly after his arrival in Vienna, Charles VI died, which left the composer without any royal protection or a steady source of income. Soon afterwards, Vivaldi became impoverished and died during the night of 27/28 July 1741, aged 63, of “internal infection“, in a house owned by the widow of a Viennese saddlemaker. On 28 July, Vivaldi was buried in a simple grave in a burial ground that was owned by the public hospital fund. His funeral took place at St. Stephen’s Cathedral. Contrary to popular legend, the young Joseph Haydn had nothing to do with his burial, since no music was performed on that occasion. The cost of his funeral with a ‘Kleingeläut’ was 19 Gulden 45 Kreuzer which was rather expensive for the lowest class of peal of bells.